When I first heard the word understory, many thoughts sprang to my mind. Is it like subtext, the story beneath the story of what is really going on? Is it a hidden passage, concealed over the years between floor levels in a castle? Or is it a secret basement, somewhat like a root cellar? Roots are involved a little. An understory occurs in forests, where plants, ferns, and small saplings grow in the shadow of larger trees. Understory is also home to leaves that have fallen from branches on high to compost on the forest floor. 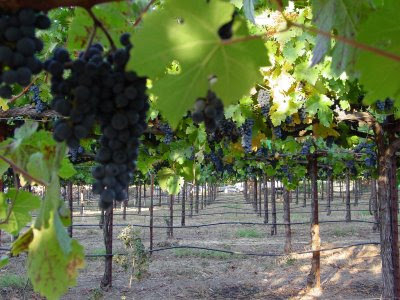 In wine, understory is an aroma that is somewhat leafy, green, and earthy. 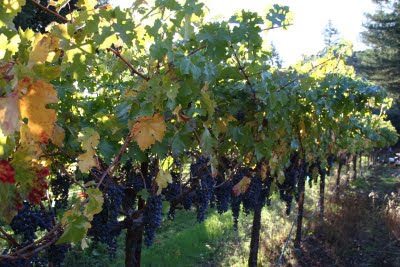 And there is an underlying scent of understory in the artisan Cabernet from Vellum. After a one year hiatus to launch my new blog over at www.euphoricfengshui.com, I’ve returned to my first-born. And I couldn’t be more thrilled to talk about this sophisticated and fine-crafted libation. 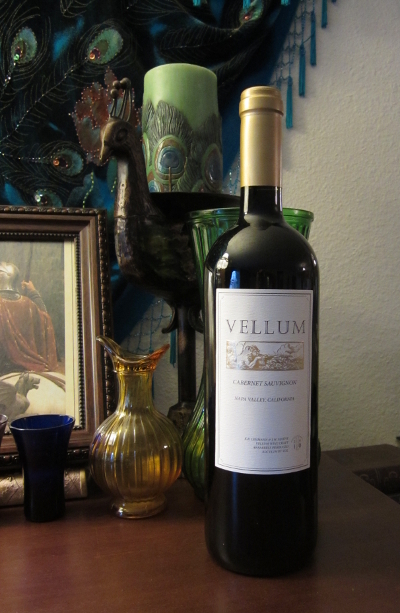 Subtle hints of understory, tobacco and currant fill out the bouquet of Vellum’s 2010 Cabernet Sauvignon. Mostly a mixture of two different cabs, a little Merlot, and a petite amount of Petite Verdot, this exuberant red has hints of blackberry, plum, minerals, and raw cocoa. This would pair well with literally any meat dish. I had a glass of it one night with pizza rolls, and the two got along perfectly. I also tried it with some white chocolate and dark chocolate – respectively – and both bring out slight nuances of vanilla in the taste. Smooth, with a medium body, this is an easy wine to drink during the long twilights of spring and early summer. But how is this specific wine a good “feng shui” libation? First, we have the complexities of the bouquet and taste of the wine. All of the plant life in the understory is of a yin energy, cool and quiet in nature,when compared to the taller trees that dominate the landscape, which have more yang energy. So there is a little yin in the aroma of the wine. This is evened out with a hint of tobacco, which has more fiery yang chi, or energy. The taste of the wine has traces of minerals (perhaps zinc?) giving a savory appeal, which balances the dark fruit influences. The label depicts a beautiful woodcut engraving of a pastoral scene: A faun or satyr playing his horn, birds in a meadow, and an owl in a tree. All of these have deep, symbolic meaning of various kinds. But what really attracted my attention was the color. The Cabernet uses the image above printed in gold on a white background. Gold is symbolic of the metal element, and is considered an icon of luxury and wealth throughout the world. White is also representative of the metal element, and the two together create a regal, alluring quality that people cannot resist. The Vellum Black and Vellum Red also use the gold illustration, but on different backgrounds, whereas Vellum White uses a white imprint on a clear setting. All of these labels have a metallic quality to them, which draws people in. 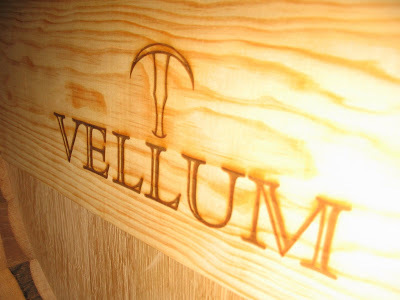 Vellum does have tours of the facility and a tasting room, but these services are available by appointment only. (Sometimes a couple of their tastings are directly from the barrel – which adds more of a wood element to the experience.) I hope to be able to partake in one of their tours sometime later in the year. I’m very intrigued to see what the environment of this area is like in person. (I don’t get up that way nearly enough). 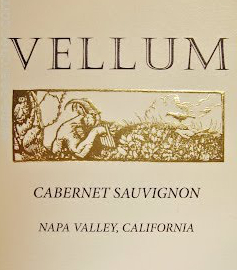 Vellum Cabernet Sauvignon is a versatile wine ideal for fancy dinner parties, tailgating before the game, or Shakespeare in the Park. I have become a great admirer of this delicious organic red, as its taste lingers on the soul like that of a good memory. Flowering trees, such as the beautiful almond tree above, are one of the best examples of feng shui plant life. Not only do most of these trees sprout delicious nuts or fruit, but their blossoms give off an alluring scent that carries on the air. Flowering branches also have auspicious symbolism. Because they usually bloom in winter or early spring, these floral tendrils represent longevity and overcoming great burdens. There are not many blossomy trees in my neighborhood, so I usually resort to the Japanese Cherry Blossom lotion from Bath and Body Works (the smell is to die for). However, on a recent trip to Solvang, a generous collection of these beneficial plants reside at Buttonwood Farm. Originally an equestrian ranch established by philanthropist Betty Williams, the property now boasts a vast vineyard, tasting room, and organic farm. 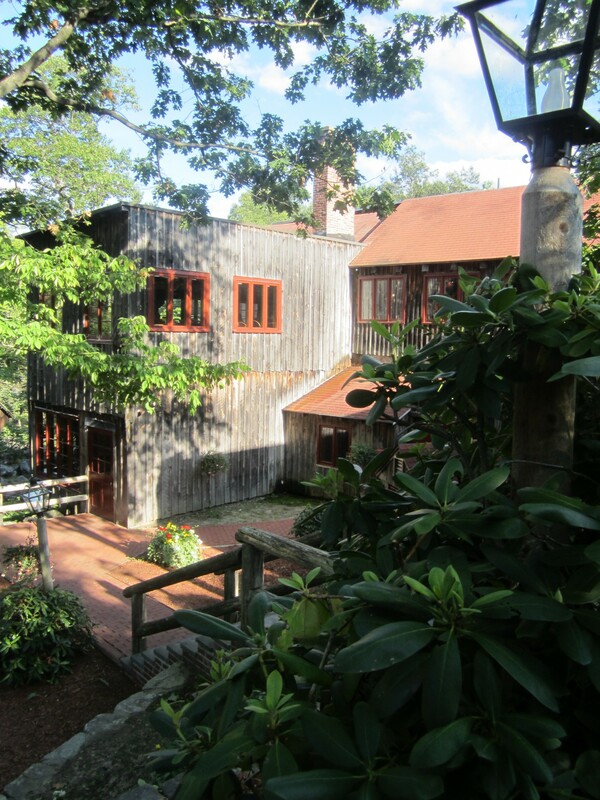 Pictured above is is the back entrance to the tasting room, which leads out to their intricate and beautiful gardens. 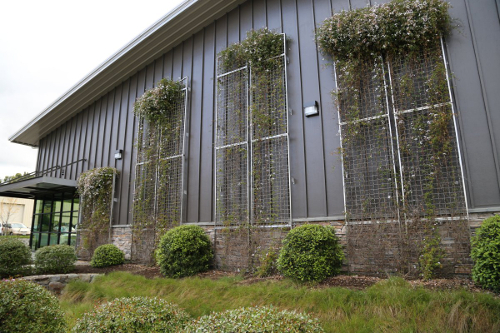 The tasting room is stylish and very serviceable. Two tasting bars reside on either side of the space, allowing for easy flow of patrons. I love the living chandelier of leaves – a highly conducive and artistic example of the wood element. 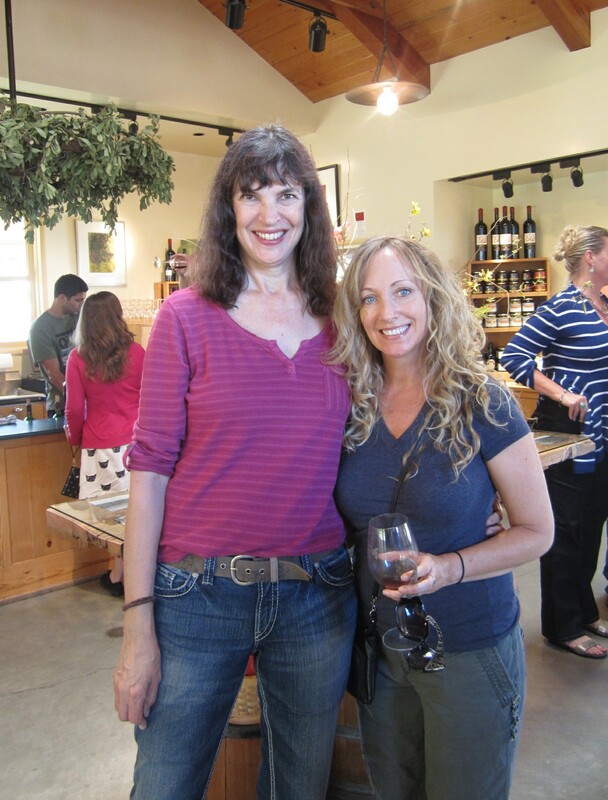 Buttonwood also has many farm-fresh products for sale, including olive oils, preserves, salsas – and my personal favorite – the Raspberry Grenache-Syrah Chocolate sauce. Decadent and loaded with antioxidants, this sauce is ideal for desserts or a chocolate martini. I was captivated by this gorgeous fountain nestled in a private garden outside the tasting room. Working fountains with clear, clean water add beneficial and peaceful chi (energy) to an environment. Daffodils were in full bloom when we visited. Also known as narcissus or jonquils, these flowers have a myriad of symbolic meaning. In feng shui folklore, the white ones represent the flowering of one’s talents and skills, and can be used in furthering one’s career. I also think they are great examples of spring; they remind me of hunting for Easter eggs as a kid. 2010 Devin – An irresistible sauvignon blanc. Influences of honey, lemon and apricot come through in a charismatic fashion. Crisp and complex. 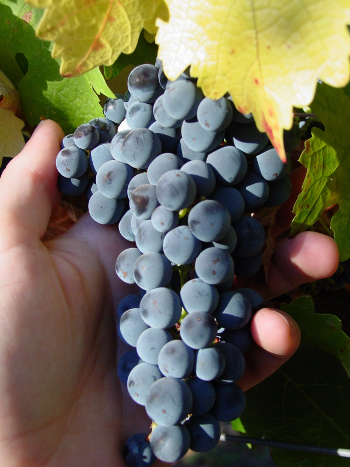 2010 Cabernet Franc – Sage and raspberry take center stage with this enticing red. Very easy to drink. Silky and sophisticated. 2009 Trevin – An intoxicating red blend composed mostly of Cab Franc. Vanilla, rhubarb and dark berries were the notes highlighted on my palate. Tasteful with a lingering finish. Comfortable seating is placed purposefully around the gardens, encouraging guests to linger with some wine and a picnic lunch. 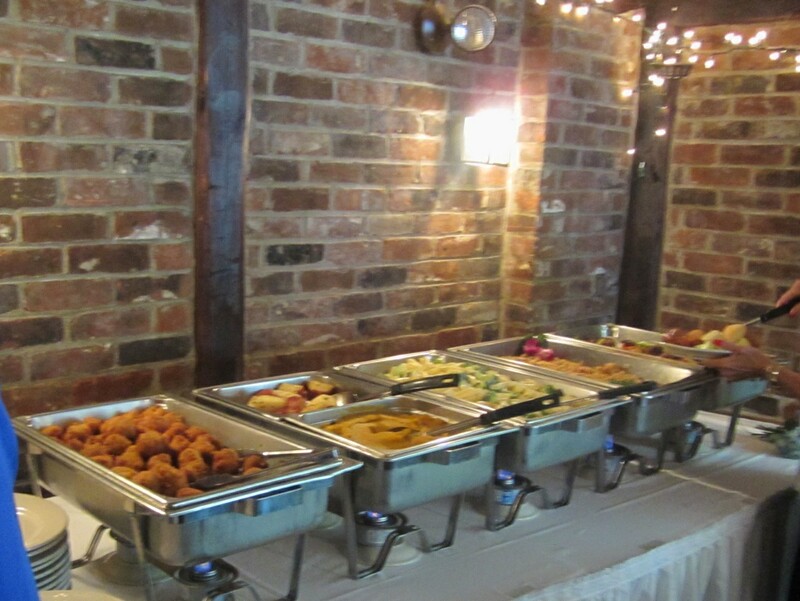 In addition to their tastings, Buttonwood also hosts many different events throughout the year, including a crawfish boil. I also suggest checking their website for some stellar recipes (I will be trying the olive oil cake recipe first) as well as their informative blog Buttonwords. I am going to try to come up at least one more time before the seasons dramatically change, so I can sit under a flowering tree with a glass of Cab Franc and just immerse myself in the auspicious environment that is Buttonwood Farm. In feng shui folklore, one of the most beautiful icons of romance is the Mandarin Duck. Known as the “Love Birds” in China and Japan, a pair of these feathered creatures together is a historic symbol of love and devotion because they mate for life. In certain schools of feng shui, these are commonly used to attract a desirable mate and promote marriage. I think ducks are cute. Unless a client has a general fondness of ducks or birds, it wouldn’t be my first suggestion to use Mandarin Ducks in an environment as decor. However, do I want some for my home? Yes!! 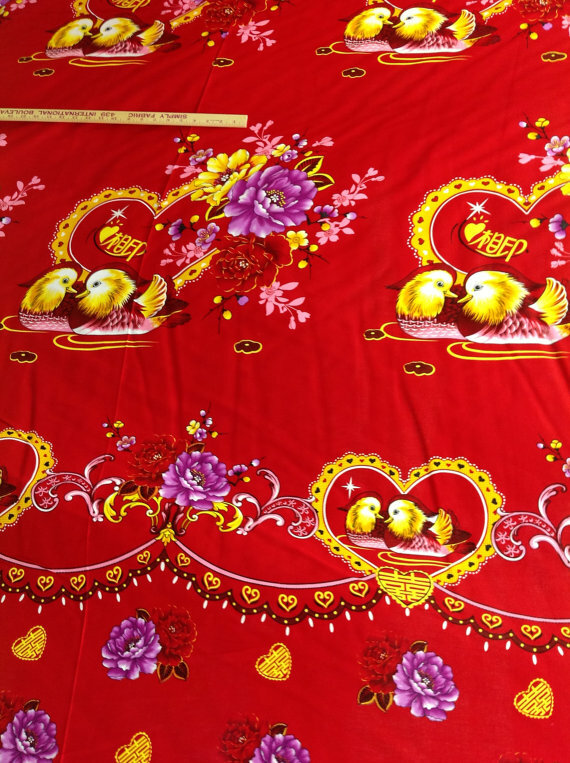 I’ve been keeping on eye on this beautiful fabric on Etsy.com with Mandarin ducks on a red background. In August, I was in Boston for the wedding of my friends Diane and Josh. Thanks to my friend Amy, a bridesmaid, I was able to attend the rehearsal dinner as her date. 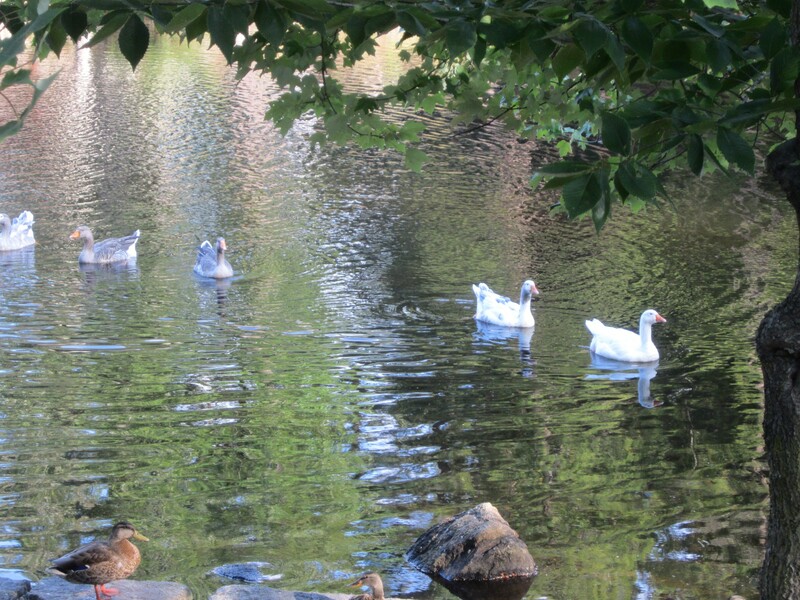 Due to their romantic symbolism, I found it brilliantly coincidental that the happy couple would pick a location highly influenced by ducks – and I don’t mean on the menu. 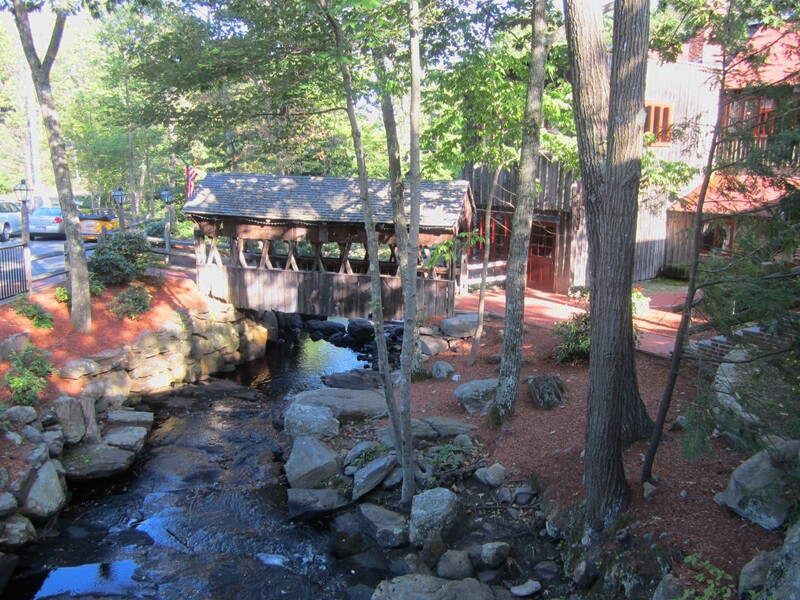 The Old Mill, located in Westminster, Massachusetts, is housed inside a historic mill with water all around. The ducks here are very happy creatures. The restaurant provides bread that guests may feed to them. 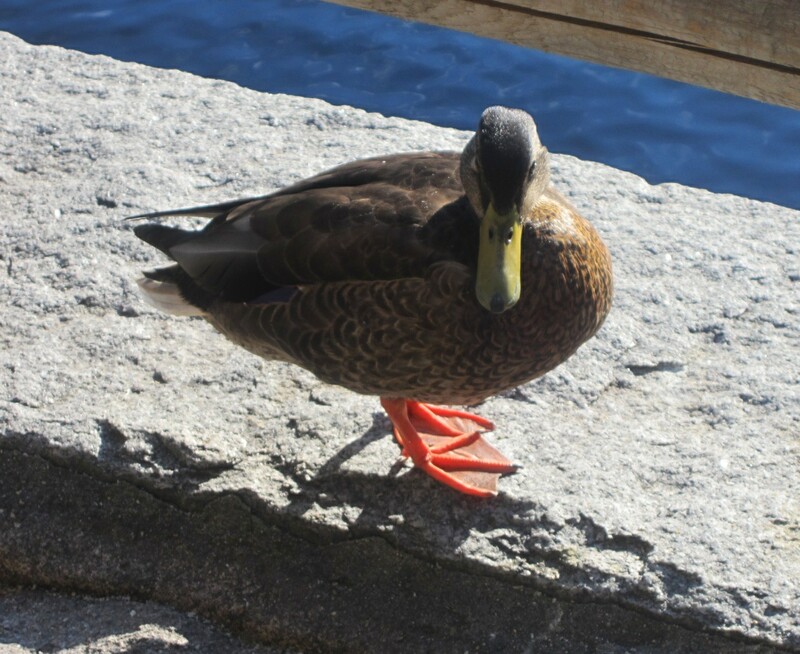 (The duck pictured above practically ate out of my hand.) Now, while these aren’t specifically Mandarin ducks, the romantic symbolism can still be applied. 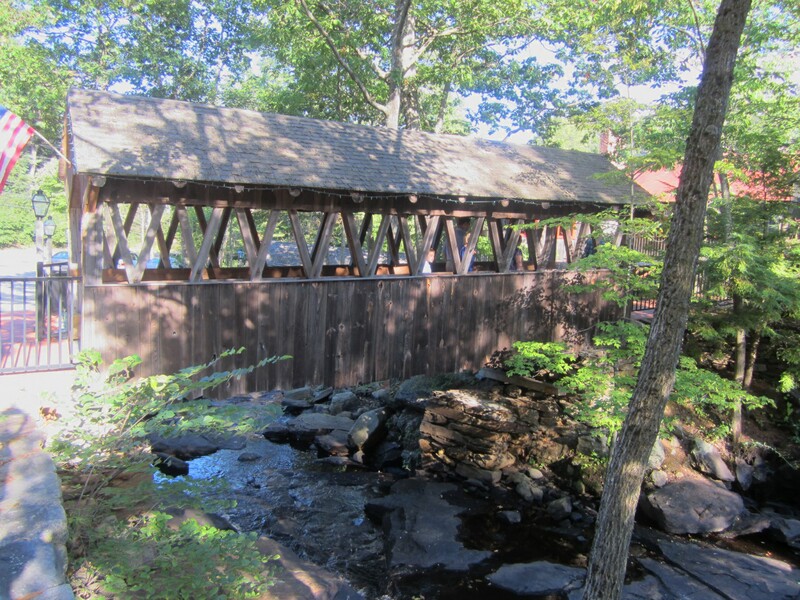 Originally a sawmill in the late eighteenth century, the mill was a thriving part of the community for five generations, before falling into neglect about a hundred years later. In 1921, it was revived into a summer tea house, operating until 1942 when war rationing of staples forced it to shut down. In 1946, the Foster family took it over, making it a year-round restaurant and bakery. They have continued to run it ever since. One of things I love about the architecture of the site is the blending of old and new. Throughout the environment, homage is paid to the historical aspects of the structure, yet making it very livable and modern. In the photo to the left, one can see the new addition to the wing, and how it melds into the vintage timber of the building. Flowing water, thriving trees, sunshine, smooth rocks, all of these are prime examples of how the elements can come together in completely harmony. 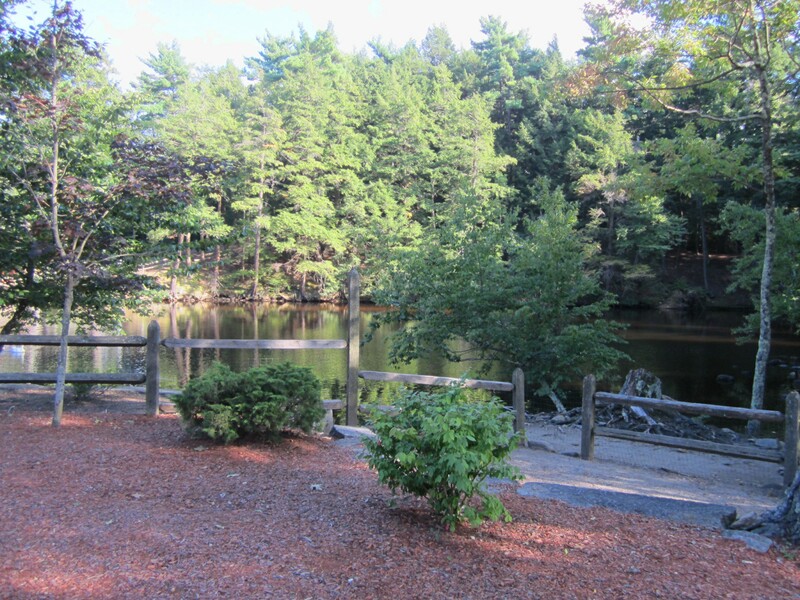 Another scenic view of the pond from the restaurant’s terrace. The inside environment was nostalgic and quaint. Tables seating four to six were neatly arranged in the dining areas. Earth was the main element present in each room; brown being the dominant color and altered wood the primary material. Because the wood used here is dead (no longer a living plant), it’s now an earth element. 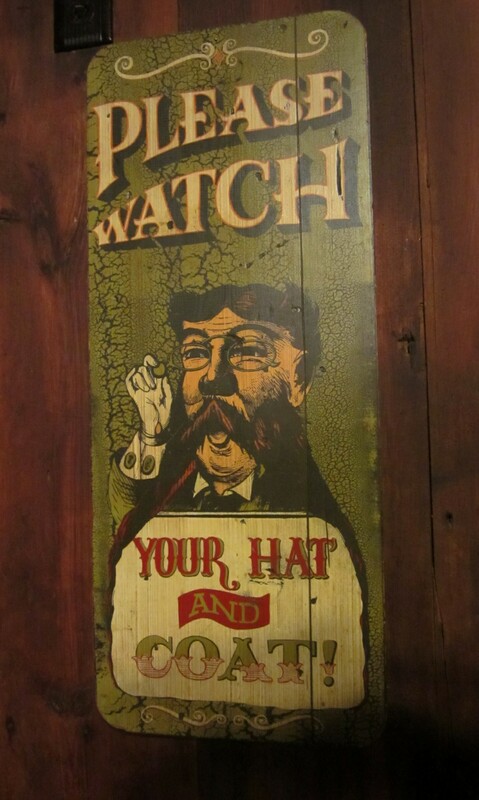 This amusing sign made me laugh because I was wearing a hat at the time. All sorts of vintage memorabilia adorn the walls, conjuring feelings of warmth and comfort. Baked Haddock Casserole with Seafood Stuffing – Rich and filling. A seafood lovers dream. Roast Prime Rib – Tender pieces of beef. Tantalizing and tasty. Caesar Salad – A classic done right. It accompanied the prime rib perfectly. Our Server, whose name I sadly cannot recall, was incredible. In addition to making sure everyone’s needs were met, she was also our bartender. 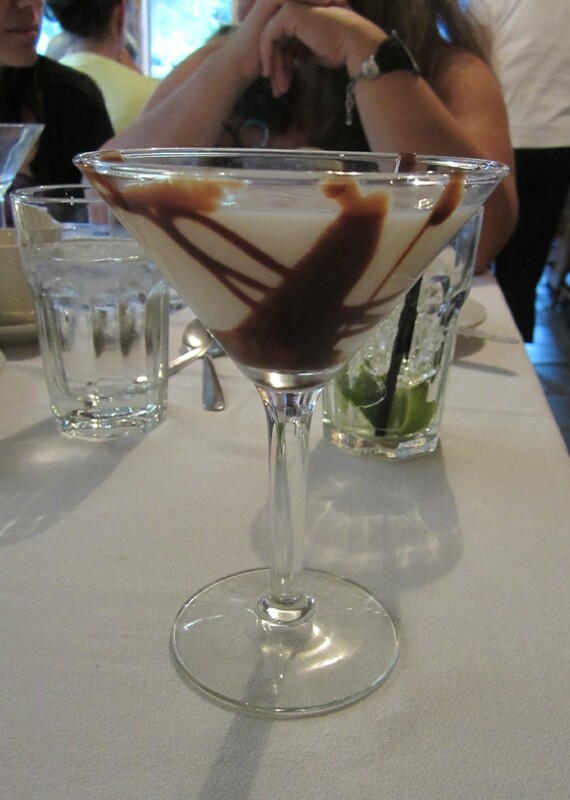 She made me, without a doubt in my mind, the best chocolate martini I’ve ever had. Just the right amount of sweetness, and the glass lined with chocolate syrup. Flawless and sublime. I was a happy man. 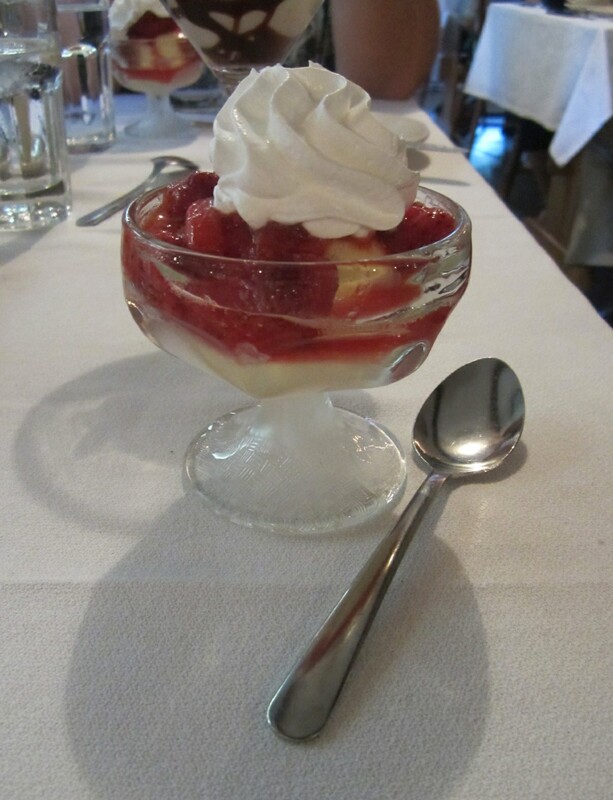 Each guest was given their own strawberry shortcake parfait, completely with whip cream on top. Refreshing and ideal for the summer weather. 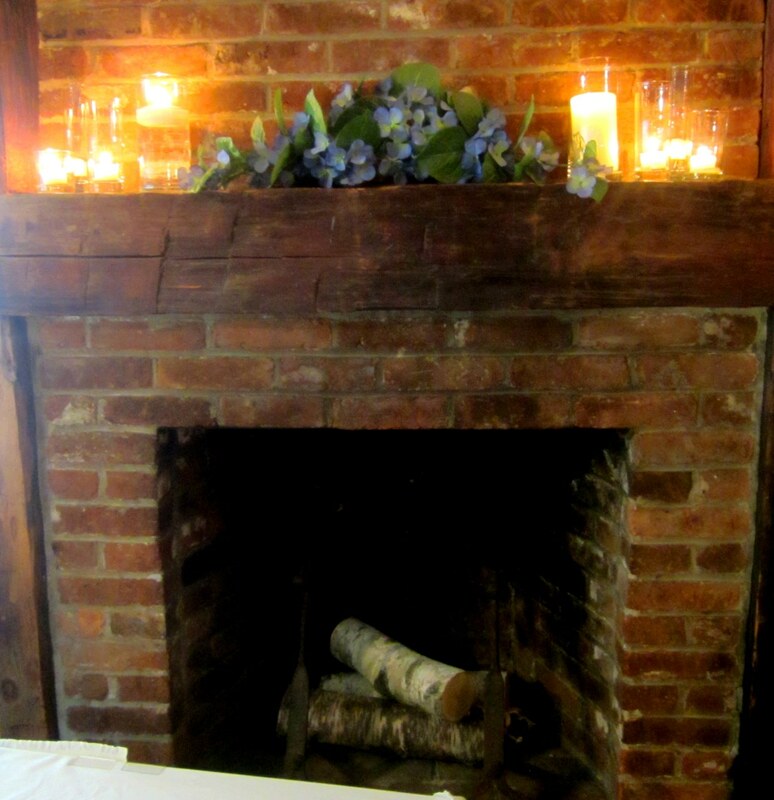 A majestic brick fireplace demanded attention in the center of the room. The candles atop were arranged by the groom’s mother and grandmother. The candles add beneficial fire energy to the celebration. After the rich and decadent meal, many of the guests made their way outside to feed the ducks. 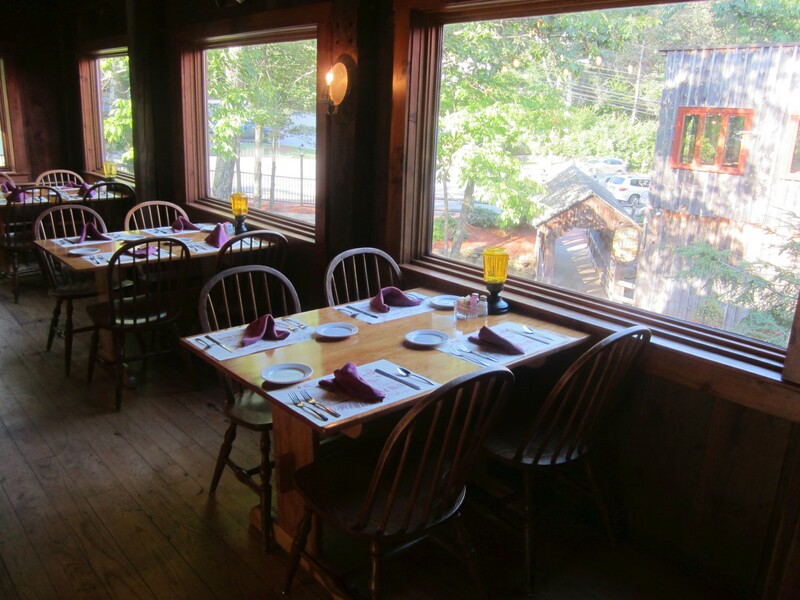 In addition to the main restaurant, The Old Mill also offers The Cracker Barrel Lounge, complete with a full bar and its own menu (although the restaurant menu can be ordered here as well). 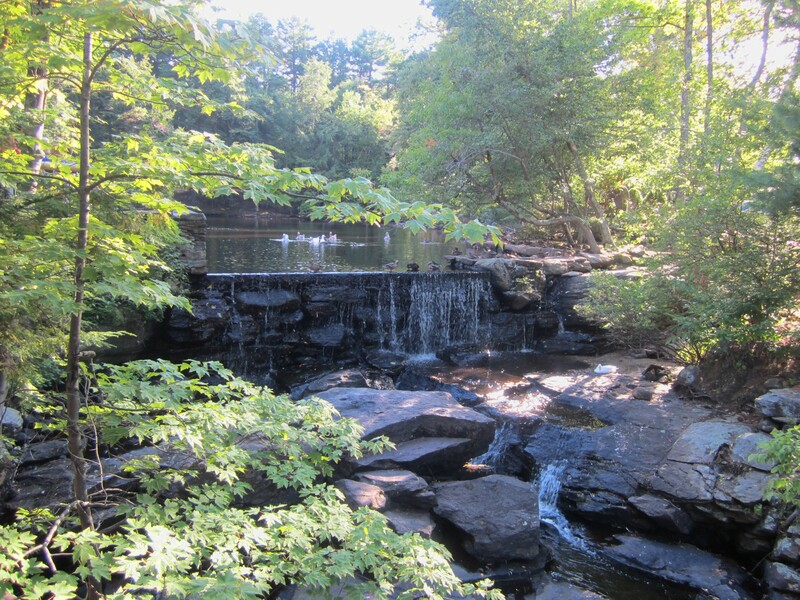 The beneficial energy of the Old Mill, due to the very happy ducks, the natural surroundings, and the historical beauty of the structure, provide an auspicious area for dining, be it for the whole family or a romantic occasion. 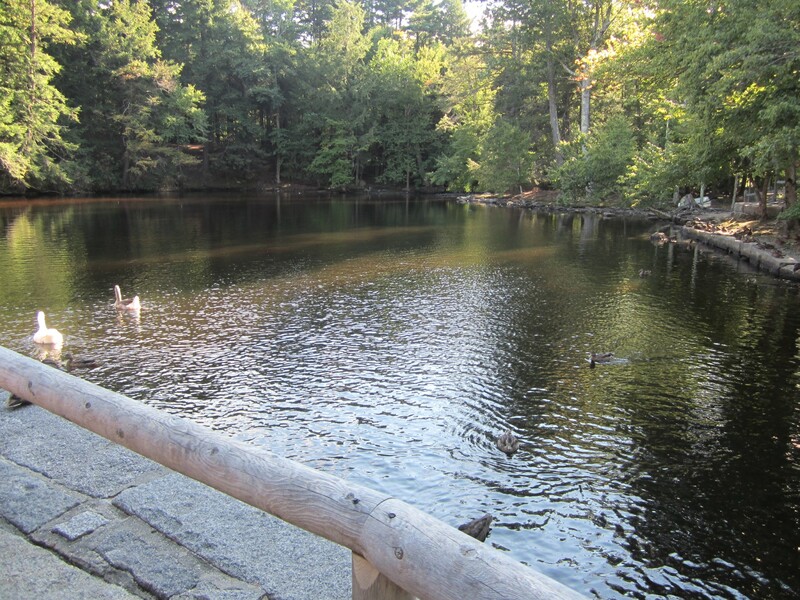 I will definitely be returning here on my next visit to Massachusetts, for the food, the drinks, and to feed the adorable ducks. 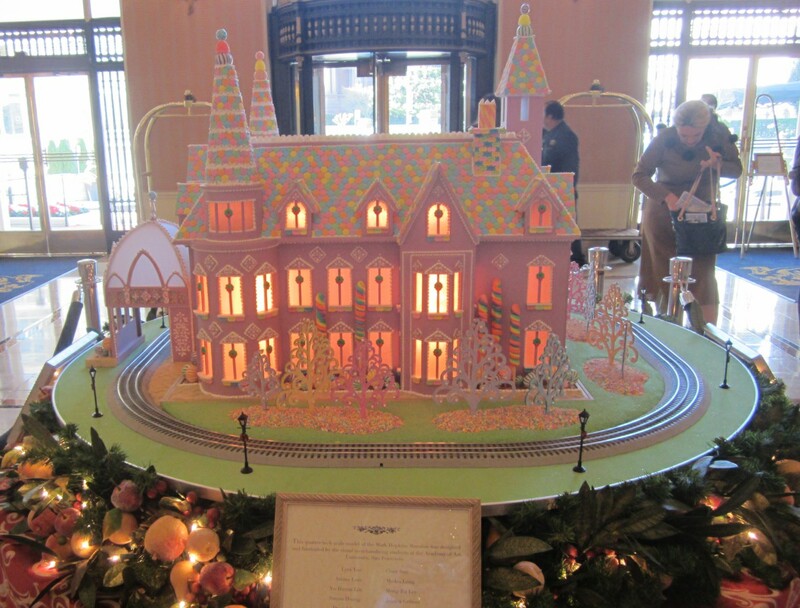 After attending the unveiling of the Gingerbread House at The Fairmont, I visited the Intercontinental Mark Hopkins Hotel. 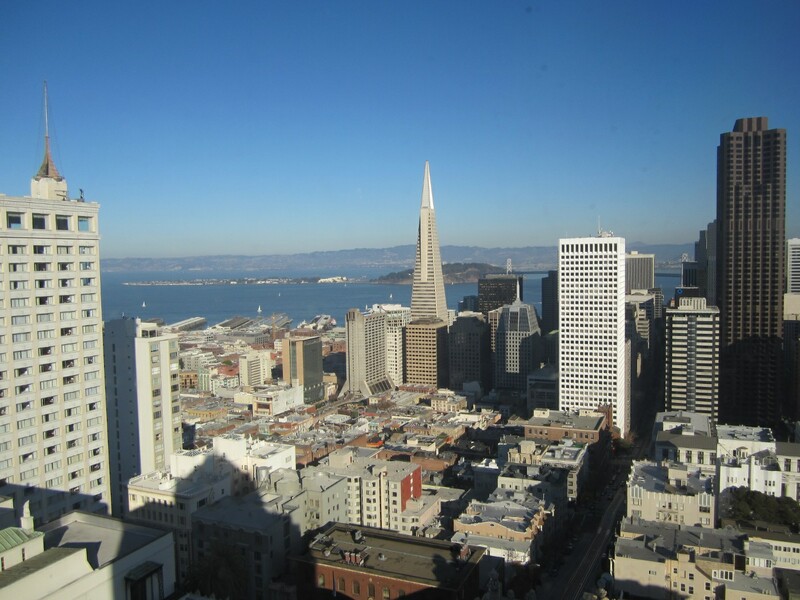 My best friend Wendy and I were advised by friends to stop by their penthouse restaurant aptly named Top of the Mark. 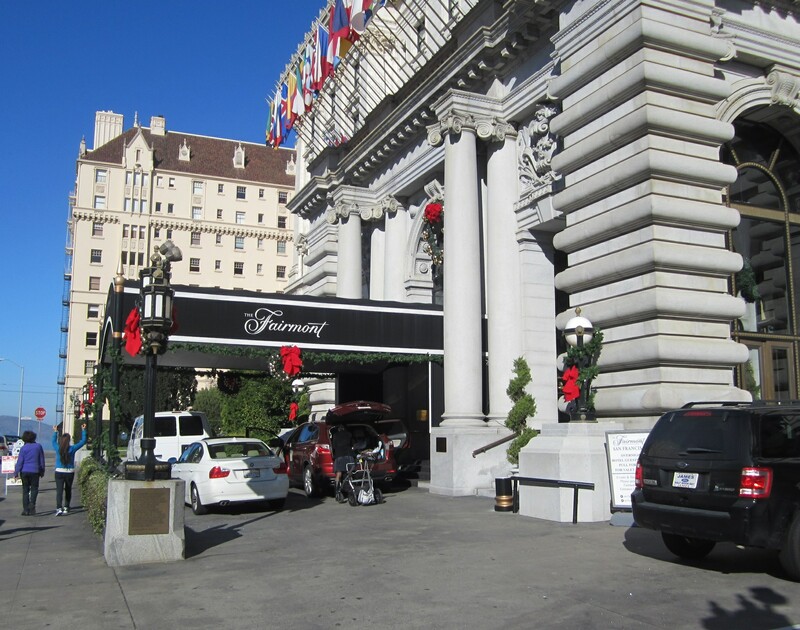 Located directly across the street from the Fairmont in Nob Hill, The Mark Hopkins hotel is named for one of the founders of the Central Pacific Railroad. In 1875, Mr. Hopkins built his wife Mary her dream house: a lofty Victorian mansion complete with turrets, gingerbread trim, and a built-in pipe organ. 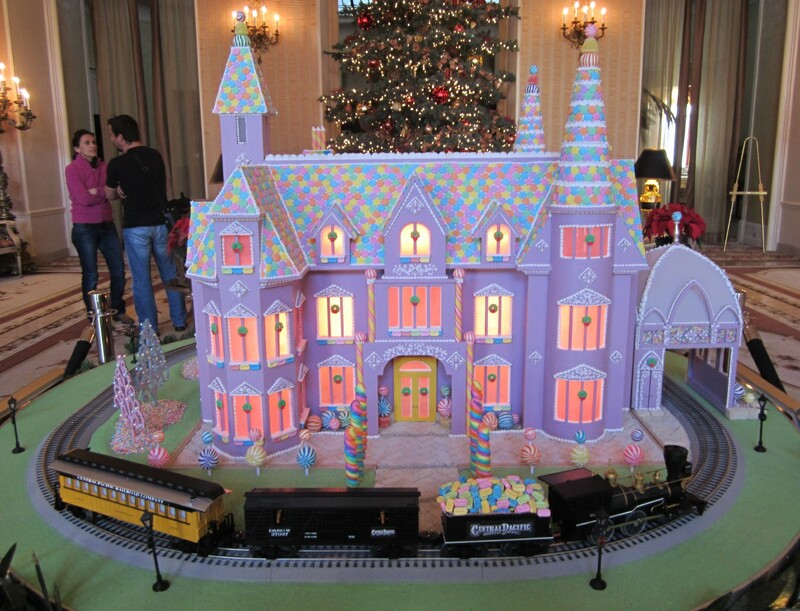 Created by visual merchandising students from The Academy of Art San Francisco, is a quarter-scale model of the famed mansion completely made out of candy. Sadly, Mark Hopkins would never see the elaborate abode. He passed away shortly before the home was completed in 1878. His widow, Mary, moved into the forty room mansion residing there for three years, then relocating to Massachusetts. She developed a close relationship with her mansion’s interior decorator, Edward Searles. The two were married in 1887. This created a scandal of the era as Edward was much younger than Mary – twenty years younger. After Mary’s passing in 1891, Edward donated the Hopkins Mansion to the San Francisco Art Association. The Hopkins Mansion had a grand, but brief life. In 1893, it became the Mark Hopkins Institute of Art, its vast rooms now being used as galleries, classrooms and studios. It stayed a creative conservatory until 1906, when it’s demise came about in a fire resulting from the infamous earthquake of that same year. Less than a year later, a temporary structure was erected in its place by the Art Association. It was also discovered that an enormous water reservoir was directly underneath the house. In 1910, hotel investor and engineer George D. Smith purchased the land. He tore down the temporary structure and begin creating a luxury hotel, The Mark Hopkins, which was completed in 1926. 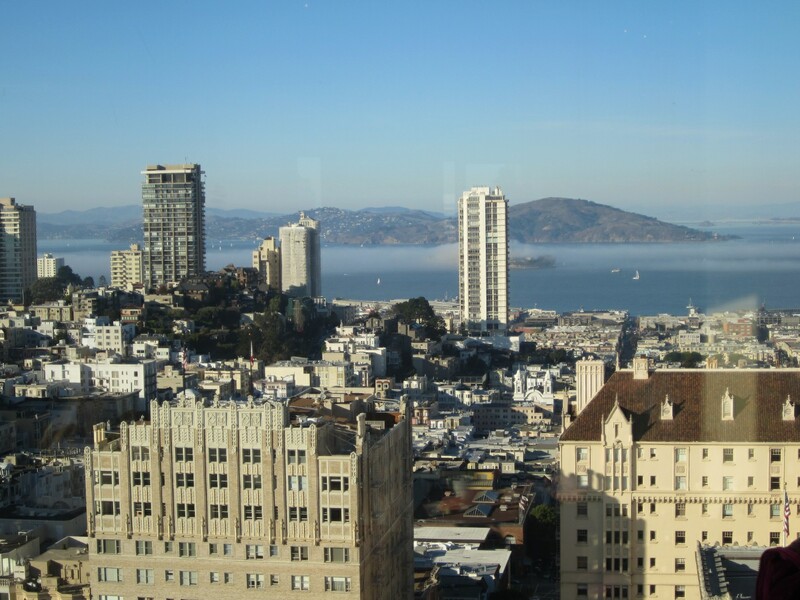 In 1939, Mr. Smith decided to convert the eleven-room penthouse in a skyline lounge called Top of the Mark. 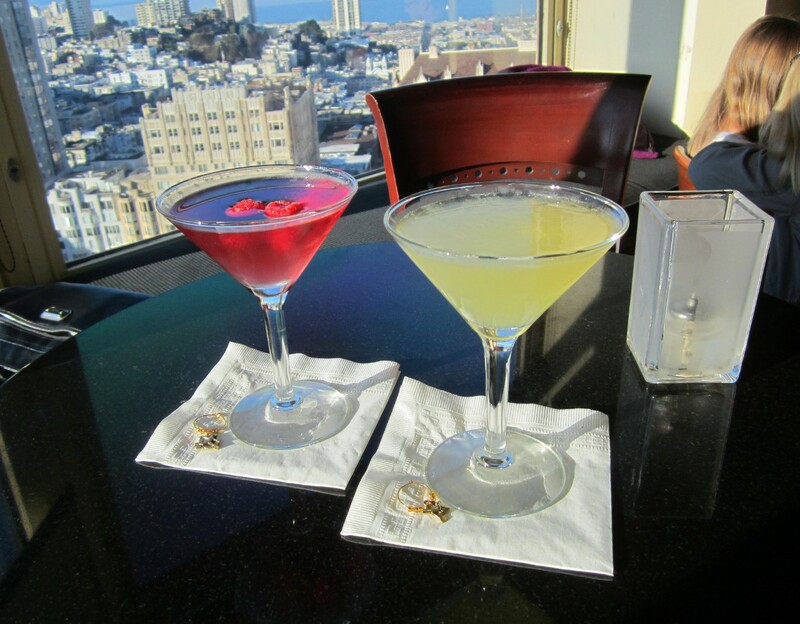 Situated on the 19th floor, the restaurant boasts spectacular views of the city and amazing martinis. 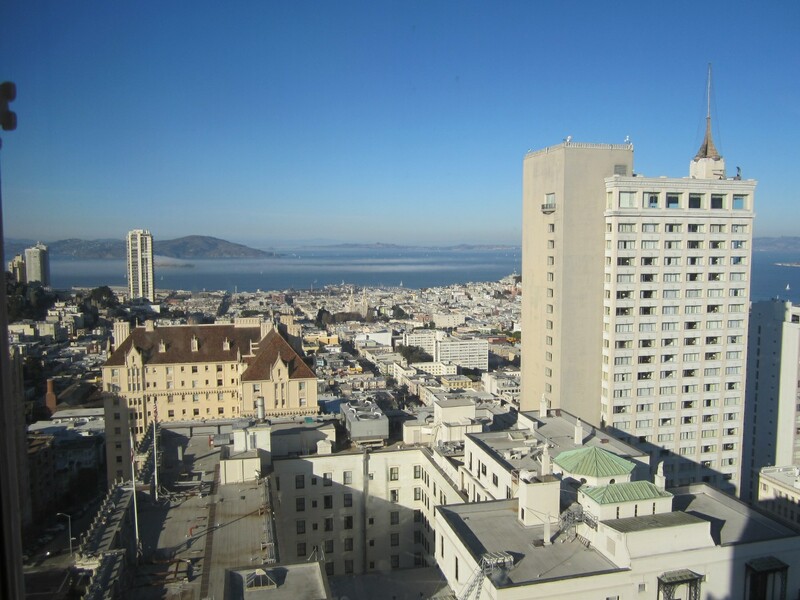 The view above is right outside the elevators on the 19th floor. This was the view right next to our table. Just exactly how is The Mark Hopkins an example of good feng shui? First off, we have the spectacular views from every window. Peaceful landscapes are some of the best examples of feng shui art, and here we have aristocratic cityscapes as far as the eye can see, with hills in the distance. Simply breathtaking. Next there is the flow of architecture. In cities with good macro feng shui, most of the buildings rise and diminish in size gradually, thus supporting a natural, calm flow of energy over and around the structures. San Francisco does this for the most part. While the Mark Hopkins does stand out from the crowd (pun intended), there are enough tall buildings situated close enough that the energy flow is beneficial and auspicious, not jarring and uncomfortable as in other highrises. Our table was near the half-moon bar on the far side of the lounge. Of the extremely vast list of martinis offered, we chose to be festive and stick with their holiday options: The Twelve Days of Christmas. Wendy went with the Ten Lords a-Leaping, a mixture of cranberry juice, vanilla vodka, Chambord and fresh raspberries. Sensational and sophisticated. I opted for the Four Calling Birds. Comprised of Beefeater Gin, creme de banana, and Galliano, this drink was heavy on another ingredient – grapefruit juice. I’m not a fan of grapefruit, but I thought it worked in this libation. Refreshing and tropical. On a separate visit, my friend Amy tried their Nine Ladies Dancing, which she said was amazing. These drinks are available through January 1st. And to all of my readers out there, I wish each and every one of you a wonderful and highly auspicious New Year. 2014 holds some great things in store for all of us! 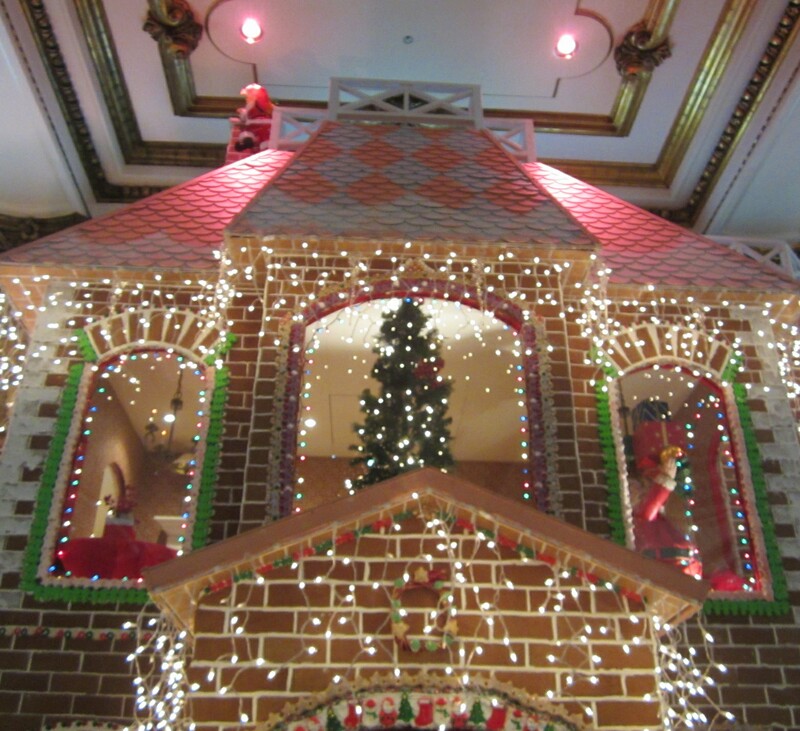 Never before have I stepped inside a house comprised mostly of gingerbread – yes, gingerbread. 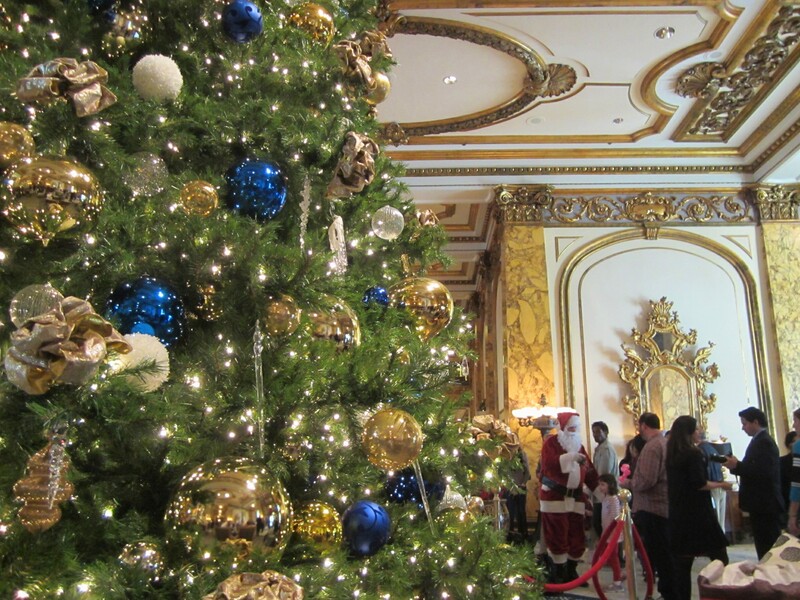 Every year, the legendary Fairmont Hotel in San Francisco transforms its lobby into a holiday paradise. This includes the annual construction of a grand Victorian manor of gingerbread, icing, and other materials (some edible, some not). 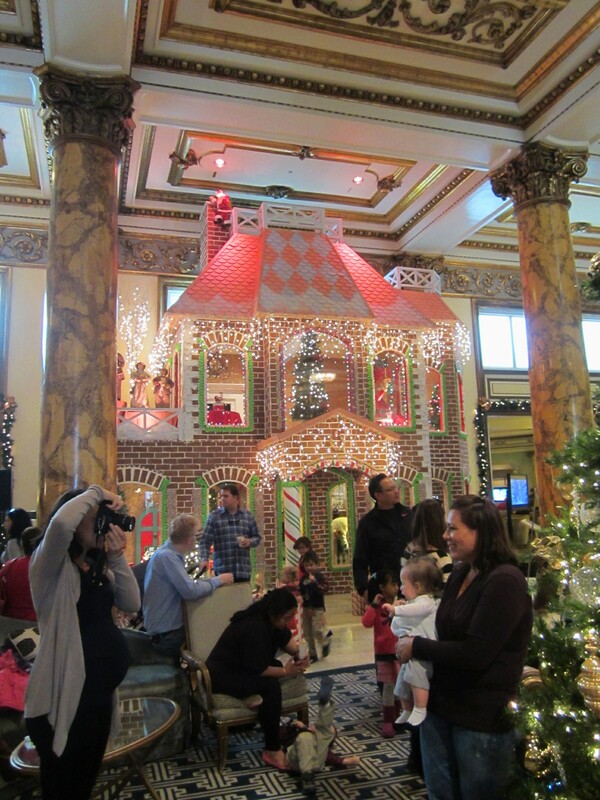 I had the fortune to visit the Fairmont for the Official Opening of the Gingerbread House on November 30th. Standing twenty-two feet high and twenty-three feet long, the Mansard style home almost touches the lobby ceiling. Feeling very much like Hansel from the famed Grimm’s tale, I walked through the doorway of the impressively festive abode. Through the front windows of the house, one can see a room in Santa’s Workshop, everything the right size for elves. A small lighted tree illuminates the front, with a four-car train traveling the surrounding track. The second floor of the home boasts a larger tree, elaborate lights, and a roof with a widow’s walk. Is that Santa I see upon the chimney? I love the attention to detail the home was given. Thick icing in shades of green, red and white frame the windows. Unlike most gingerbread houses, there was a surplus of edible building materials for the guests at the event. One could eat the cake, and have it too, so-to-speak. I was able to sample some and it was sheer holiday perfection. It went amazing well with the hot chocolate that was also being passed out. Notice another view of the elfin workshop through the window. 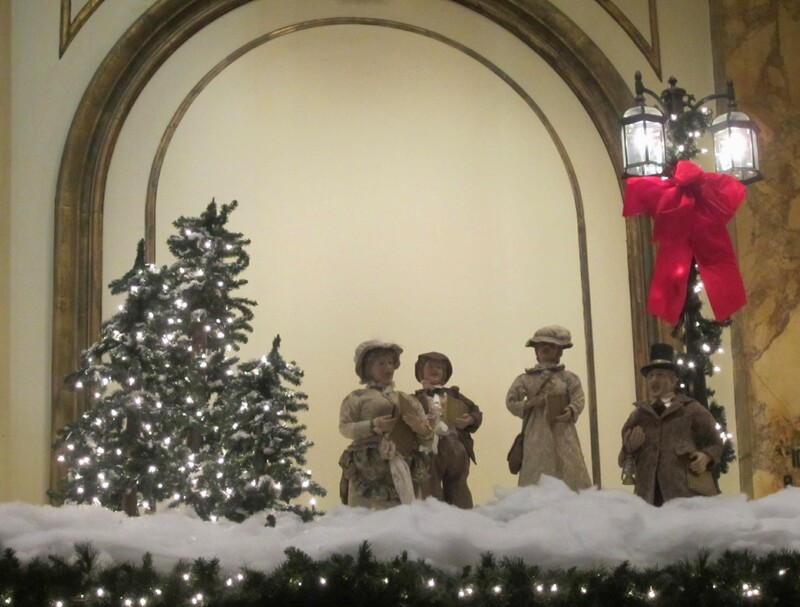 A life-size tall Nutcracker has his own room in the tower of the home. I estimate him to be about five feet tall. 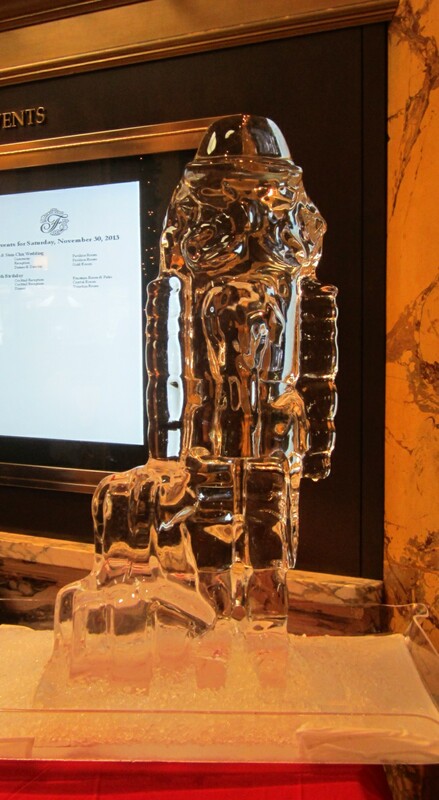 A Nutcracker carved of ice was on display for the opening. Beautiful and exquisite. 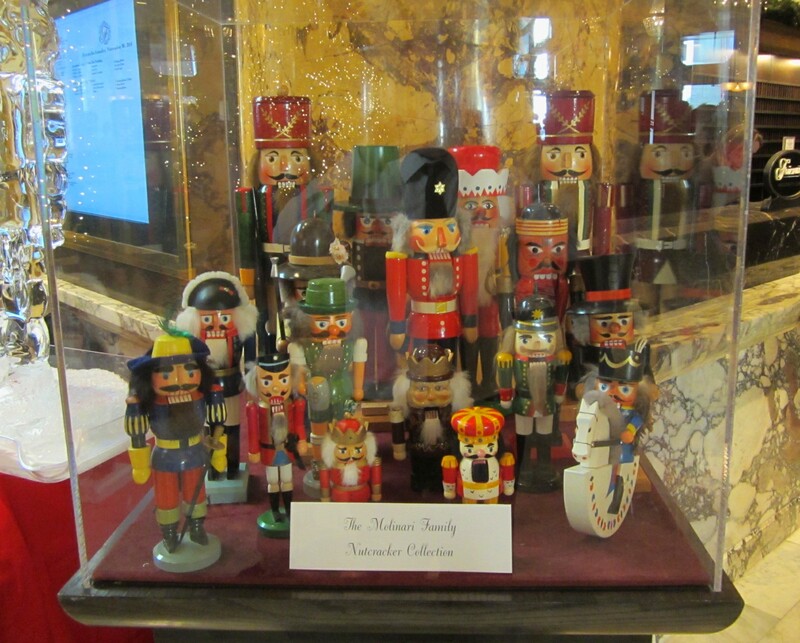 On loan from the San Francisco Ballet is the Molinari Family Nutcracker Collection, on display throughout the holidays. Which nutcracker is your favorite? 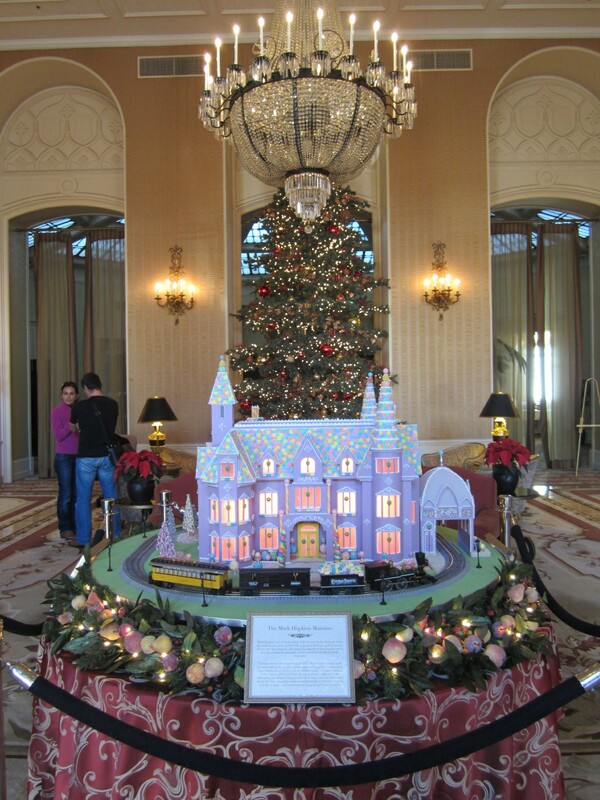 In fact, there is even a friendly competition between The Fairmont and the Westin St. Francis, as to who has the better gingerbread creation. I haven’t seen the other house, but it is much smaller in size and more castle-like. 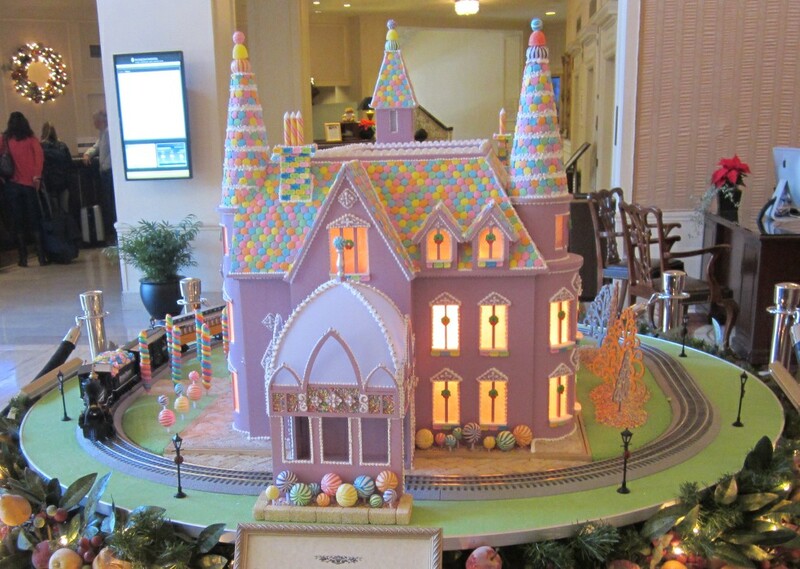 As for feng shui purposes, The Fairmont’s Gingerbread House creates a full-fledged environment. How, exactly, is this specific gingerbread house good feng shui? 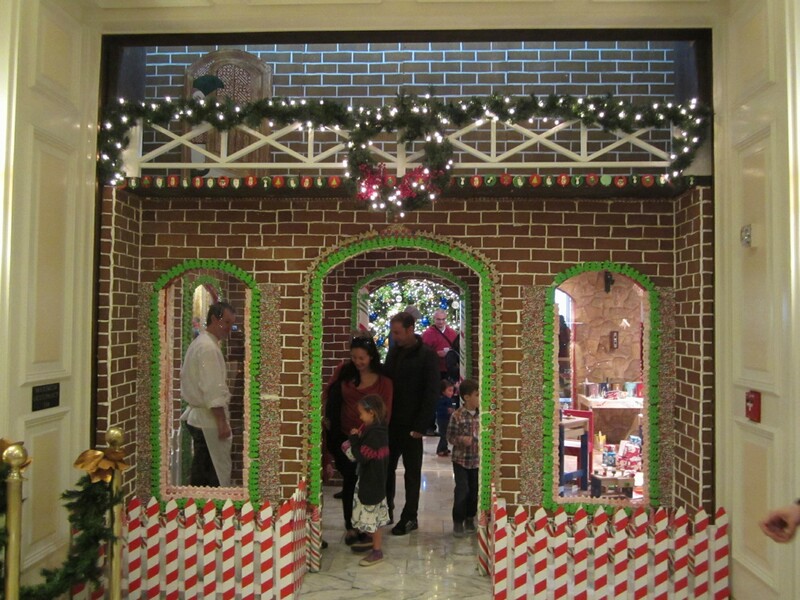 Well, unlike most gingerbread constructions, one can actually walk through this one (they are typically much smaller). The house is also structurally sound. 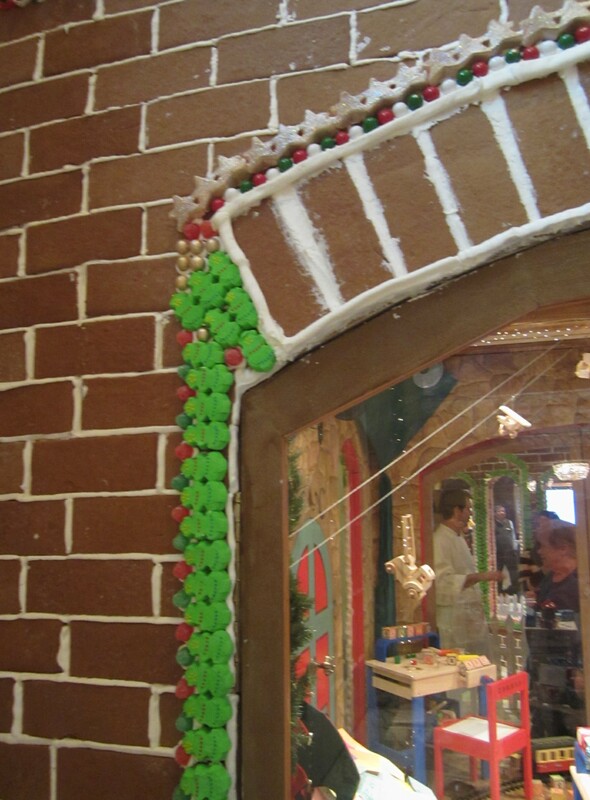 Following building codes, a wood frame acts as skeletal support, with the gingerbread and other materials then applied. And then there is the smell. 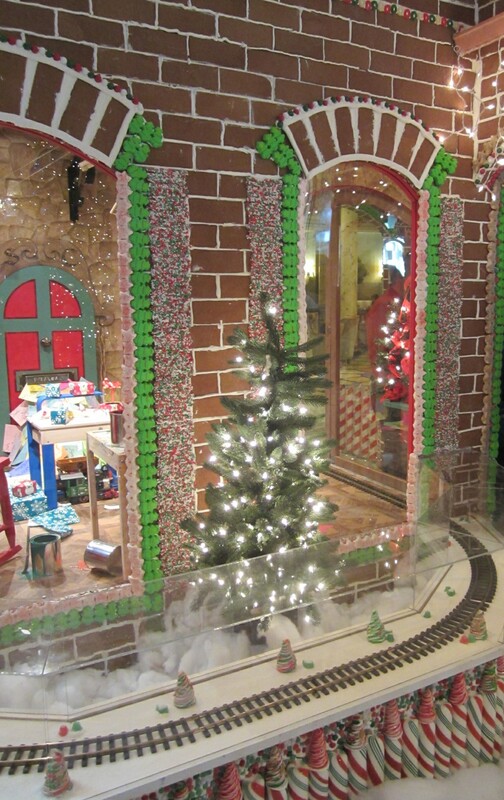 The aroma of gingerbread fills the lobby’s environment. This fosters a sense of festive holiday cheer. And the closer one is to the house, the stronger the fragrance. The new addition this year to the house was the Gingerbread Doghouse. Located over in the kid’s section of the event, I was unable to get a good photo of it due to the crowd. This area was ideal for kids to make their own fanciful buildings and drop off letters to Santa Claus in his designated mailbox. However, he was there in person if one’s Christmas List needed immediate attention. A beautiful tree takes center stage in front of the main entrance. Decorated in golds, silvers and cobalt, it harmonized perfectly with the gilded resplendence of the lobby. I loved the carvings on the mirrors and walls of the entry hall. 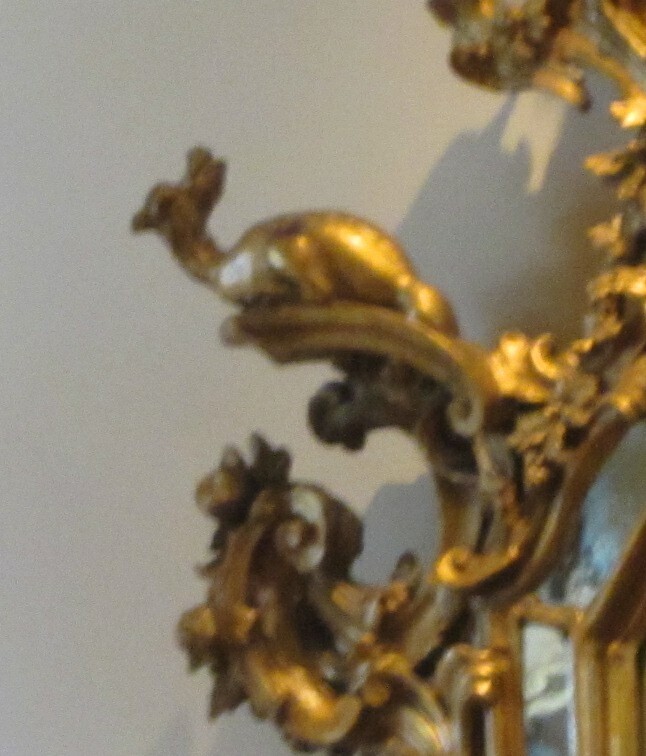 Above is a close-up of the birds attached to the golden mirrors that hang throughout. Simply stunning. 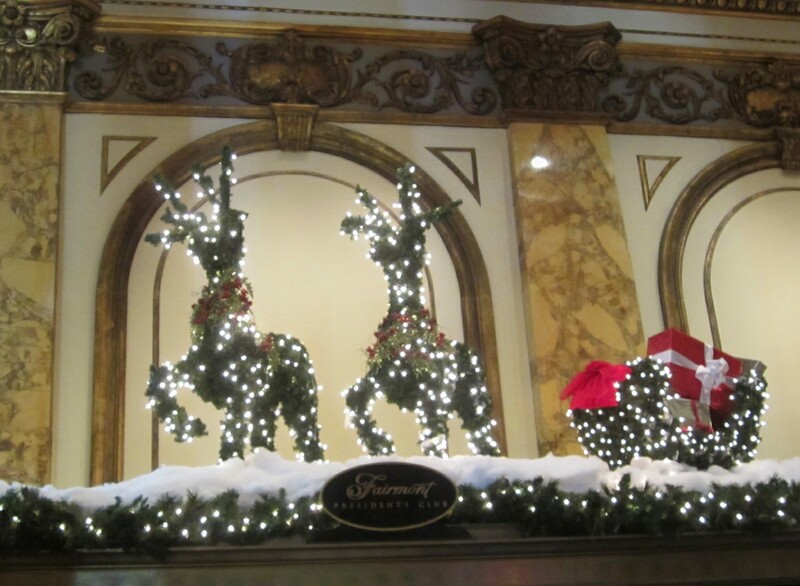 Topiary sculptures covered in lights adorn the roof the lobby’s front desk. 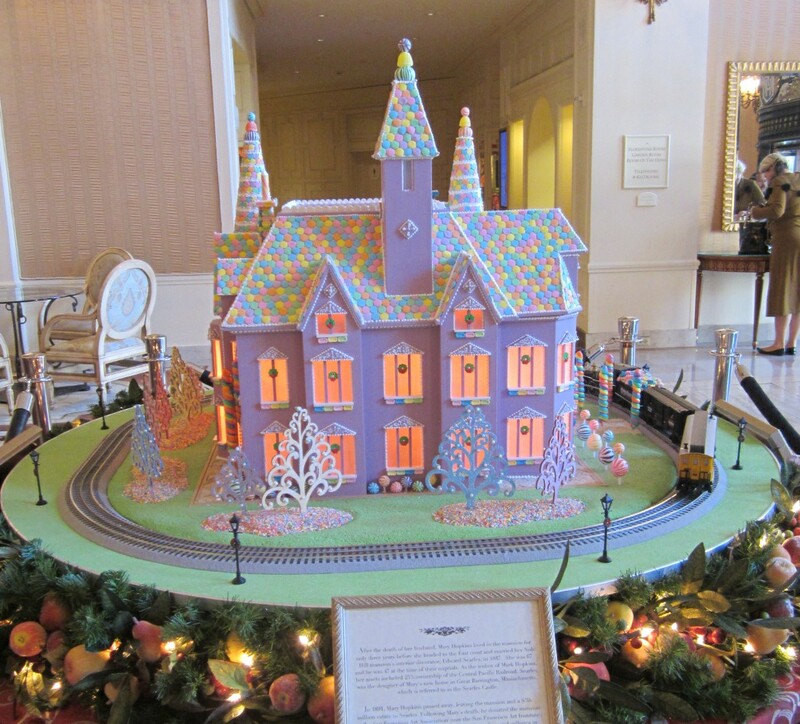 The Gingerbread House will be on display through January 1st. Who is the Feng Shui Foodie?